The world is a tapestry of color. It signifies the changing of seasons and can also change our physical moods generating emotional feelings such as serenity, anxiety, and happiness. Along with texture, they help us to identify objects in space by creating contrast and depth. Understanding it is a science but need not be that complex for our purposes. We will start with the basics of knowing how they interact with each other. This will guide us in our selections and of course if you are working with a design professional, they can help you simplify the process even more. Before actually selecting our final palette, we must decide what role color will play in each room and what affect we are trying to achieve. Do we want bold and dramatic? Or neutral and calming? Is it an emotional response we are trying to evoke? Are we creating an illusion to possibly cheat the eye? To know the answer, we must have an understanding of what type of decorating style we like. Is it Contemporary, Traditional, Primitive or French Country? Although it can change from space to space (eclectic), most people usually lean towards a particular style. If you are not sure what style you like and haven't already read the section on Decorating Styles you should do so now. It will help you determine the schemes that work best for your individual taste. OK, so you know what style you like. Lets start to imagine what our room will look like. Start with what you know. What this means, is to think about all the things they you already have that will be re-used in the space. Is there a favorite couch, rug or pillow you want to put in the space? What colors are in it? What is it smooth or textured? Pick out a dominant color in the piece and then build your palette around it. Ceilings should always be the lightest in the room. Choose lighter hues on large surfaces if you want to make it look open and airy. Darker tones work better for floors, accent walls and trim. An easy way to learn about color is to pick up an inexpensive color wheel at your local arts & crafts store. The wheel consists of 12 colors that pretty much all others are created from. But more importantly the wheel illustrates the relationship of how they interact with each other. Which ones complement and which contrast. It can be an extremely useful tool. They can also create a feeling of temperature. Cool colors are restful and peaceful and include blues, greens and shades of purple. They also give the illusion of increasing the size of the room. While warm colors are stimulating and exciting and include yellows, oranges and reds they also tend to give an appearance of a decreased room size. And don't forget about gray. All shades have become a favorite choice for many. Because of its ability to strengthen the effects of others, it is mainly used as a complement and not the main color. 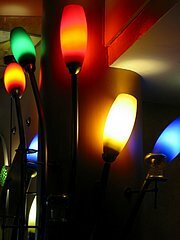 It is generally a good design idea to try to carry at least one color throughout the house. A consistent trim, wall or flooring color will give us a way to tie the rooms together. The following is a list that will help you evoke a certain emotion. There are three basic schemes that most designs are based on. We’ll look at the definitions of all and also the pros and cons of each. 1. Monochromatic - The term comes from the combination of mono means one and chroma meaning color. It is a simple scheme using several versions of one color that varies in value. The benefit to this type of scheme is the appealing balanced look. The negative is that it can be boring and drab. 2. Analogous - Which uses three to five colors that are aligned next to each other on the wheel. Analogous designs have the advantage of looking a little bit richer than that of the monochromatic but it too is less vibrant and lacks contrast. 3. Complementary - Is made up of colors that are found directly opposite each other on the wheel. Examples would be variations of red and green, yellow and purple and blue and orange. The plus to this is that it offers strong contrast and draws attention to your design. The disadvantage of the complementary scheme is that it is harder to balance especially if using warm hues. Be careful not to get too caught up in current trends. Think long term if you can. Even though painting and papering can be an inexpensive way to change a look from time to time, you really don't want to keep changing it because yours have gone out of style. Try to think more in terms of decorating styles and schemes that you can adapt with subtle changes over the long haul. If you do find yourself in a situation of being dated, you might try just changing an accent that is in vogue to bring your style back. Remember that whites and all shades of white are eternal and never go out of style. Paint shops and home centers offer consumers a great service by providing swatches and brochures to make your decision making easier. Aside from the swatches, they also offer brochures which usually show schemes with two more colors. And usually are displayed in a room to give you ideas. Use these to help make your final selection. Before purchasing the quantity of paint required for your home, purchase a small amount (a pint if you can). Paint a good size sample on the wall and let it stay there for a few days. This will give you time to decide if you like it. You can also do this with trim and accents. Texture is another way to breathe life into a space. A plush carpet or soft knitted throw will add warmth and comfort to your home décor. They will however make a room feel smaller. On the other hand mirrors, glass and metal surfaces will make the room seem larger as they have more light reflecting properties. But be careful, as they will also make the room feel colder. Using textures and patterns is also a great way to create a focal point in a room. They will help add character to a space. A patterned throw on a sofa will create an area of interest. A single papered wall or a bookcase of a different color all will help achieve a central design element. Texture also affects how we see color. Smooth textures reflect light while rough ones will absorb the light. Also, by introducing techniques such as faux or sponge painting into your design is another inexpensive way to add a special texture or pattern. Ultimately your design should be a representation of the individuals who live in the space. Open up your mind to endless possibilities. How To Faux Finish - How To Faux Finish Information on faux finish painting techniques and general interior painting. Includes step by step instructions and tips on everything from surface preparation to choosing colors.